The aging paint shop at Fiat Chrysler’s Brampton, Ont., assembly plant will be gutted and rebuilt in 2017 as part of the tentative labor deal the automaker and Unifor reached on Monday, a significant victory for the union following weeks of contentious talks. The deal, which also includes an investment in the Etobicoke casting plant in Toronto, wage gains and changes to pension plans for new hires, was reached late Monday just minutes before workers were set to strike at midnight. About 9,750 FCA workers represented by Unifor are set to vote on the contract this weekend. Should workers ratify the deal, Unifor will immediately begin negotiating with Ford Motor Co. on Oct. 17, with a strike deadline of Oct. 31. 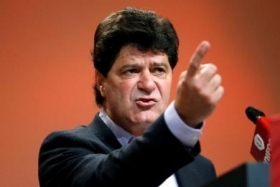 Unifor President Jerry Dias’ sales pitch to his members early Tuesday morning was simple: The union wanted to secure jobs in Brampton by investing in the paint shop, and it was able to do that. Investments at Brampton would total C$325 million, Dias said. Improvements would begin in the summer of 2017. The investments come despite FCA previously balking at committing to following the pattern set by the new contract reached with General Motors in September, which included product commitments for plants and similar wage gains. According to the union, the FCA until late Monday had deemed the pattern to be “too rich." Dias said the investment commitments mean Unifor was able to meet its top goal in negotiations with FCA: Securing the long-term prospects of the automaker’s three Canadian plants. “There’s going to be a much broader discussion in Canada over the years to ensure that this industry -- the No. 1 export industry in Canada -- is not only stable for the present, but we’re also going to be challenging governments and having discussions with governments about the long-term,” Dias said. Dias said the deal also includes a commitment to assemble a plug-in hybrid at FCA’s Windsor assembly plant, which already produces the Chrysler Pacifica and Dodge Grand Caravan. A Unifor spokeswoman confirmed Tuesday that product will be the Pacifica plug-in hybrid FCA showed at the Detroit auto show in January and which was scheduled to go into production next month in Windsor. The deal’s wage and pension provisions mirror those of the GM contract. Workers will receive a $6,000 signing bonus, legacy workers will receive a four-per-cent raise over the life of the deal, and new hires get wage increases each year under the 10-year grow-in period. FCA previously expressed skepticism with Unifor bargainers regarding the GM deal’s wage provisions, specifically the pay raises for new hires. FCA executives have said the new wage provisions could prove to be too costly for the company, particularly at its Windsor assembly plant, where roughly 5,000 employees build minivans. The deal comes after Unifor said throughout Monday that FCA was balking at following the GM pattern. Dias gave credit to FCA CEO Sergio Marchionne for his “candid” talks with the union, which he said allowed the two sides to break through. Marchionne began meeting with Dias on Saturday, the union chief said. Dias also said the call to invest in Brampton was Marchionne's. Because the agreement remains subject to Unifor member ratification, the company declined to discuss specifics of the agreement. Like the GM deal, new FCA hires will be placed in a defined-contribution pension plan, which shifts much of the risk associated with retirement benefits away from the company and onto employees. Details of the FCA plan were not immediately known, but the GM plan requires the automaker match a mandatory four-per-cent contribution rate by workers covered by the plan. Dias said a C$6.5 million) investment in Etobicoke is designed to “refurbish, rebuild, to update the machinery” at the plant. He said a team of engineers will visit the plant within 60 days to make decisions about where “we can get the best bang out of our buck” in upgrading equipment. Dias said the discontinuation of the Dodge Dart and Chrysler 200 would have impacted between 150 and 200 workers at the plant. While those workers would still no longer work at the casting plant, Dias said they would be offered employment opportunities at the Brampton assembly plant. Ratification votes are set for this weekend, Dias said. He said the union is confident that it would not need to do much selling on the pact. The upcoming talks with Ford could prove to be tricky, despite the pattern agreement. Dias has said Ford, like FCA, has expressed concerns over changes to the 10-year wage grid for new hires. Local union leaders at Ford’s Oakville, Ont., assembly plant have also expressed skepticism about the pattern set by GM. Dave Thomas, president of Unifor Local 707, told Reuters on Oct. 3 that his members “have huge concerns” about the GM deal, saying they want a more generous deal that would shorten the 10-year grid. Dias said the union’s top priority in negotiations with Ford would be securing investments at the automaker’s Windsor engine plants. Greg Layson and Reuters contributed to this report.